ILPS Canada joins with other voices around the globe to condemn continuing attacks on the People’s Global Conference (PGC) and the banning of all public activities in Bali by the Indonesian government of President Joko Widodo and police and intelligence units. The PGC was set to start October 11, 2018 with a public Open Space event and continue with a Plenary on October 12-13, coinciding with the International Monetary Fund – World Bank (IMF-WB) Annual meeting in Nusa Dua, Bali. The PGC is a peaceful activity that was meant to gather civil society and people’s movements to understand how IMF-World Bank policies will impact the lives of peoples and communities. 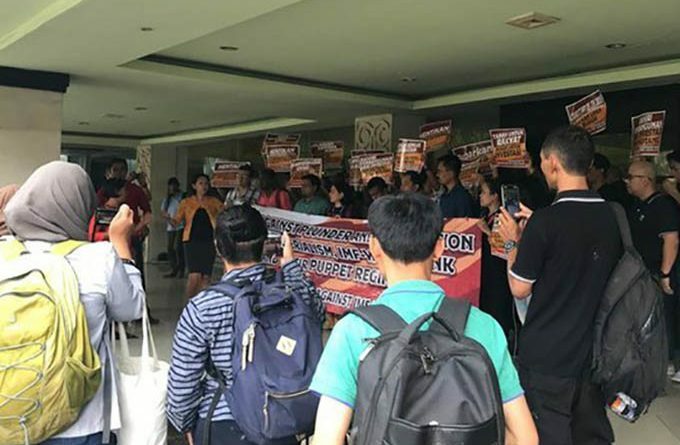 Police have twice revoked permits to hold the PGC events, despite ongoing dialogue and meetings between organizers, the IMF-WB, and Indonesian authorities. Police pressure was exerted on the Radio Republic Indonesia (RRI) Auditorium, Nirmala Hotel and other venues of the conference in Denpasar, Bali to refuse the PCG space to meet. The PGC also revealed in a press release that posters tagging the event as “terrorist” were being circulated online and delegates were receiving threatening text messages. Despite the crackdown, organizers of the Peoples’ Movement against IMF-World Bank are determined to push through with the PGC in some form, refusing to “bow down to the authorities’ desperate maneuvers to keep us from asserting our rights” and allowing farmers, fishers and other ordinary people a chance to air their grievances and views on the IMF-WB. The organizers point out that the IMF and World Bank have previously chosen host countries for their meetings, like Indonesia, that are hostile to the free exercise of peoples’ rights. More than a hundred international delegates and hundreds of local activists are in Bali to take part in the PGC. They represent some 50 civil society organizations and peoples movements from Latin America, Asia, Africa, and Europe. One controversial topic to be discussed is the role of the IMF-WB on the massive land and resource grabbing in the global south, including Indonesia. Farmers, indigenous peoples, peasant women, and fishers from Kenya, Bolivia, India, Nepal, Sri Lanka, Pakistan, Cambodia, and the Philippines will also share their country’s rural struggles. “This government is hellbent on keeping the public and the world in the dark about its massive land deals for oil palm plantations, the continuing burning of forests, its multi-billion investments in dirty coal power plants, and the rampant killings of land and environment defenders!” said Roy Anunciacion from the Peoples’ Coalition on Food Sovereignty (PCFS), a member of the coalition of groups organizing the PGC. The Coalition cited that the World Bank Group has directly funded land deals spanning at least 900,000 hectares and provided securities financing to over 700,000 more in Africa, Latin America, South and South East Asia including famine-stricken Ethiopia and Democratic Republic of Congo. Canada was founding member of the IMF in 1945 and continues to be its eighth largest contributor out of its 188 member countries. Today, the IMF-WB’s policies are keeping living standards and working conditions substandard in many countries since they are forced by the IMF-WB to provide a cheap source of labour and to cut social programs. Countries have lost their self-sufficiency in providing food when IMF-WB programs have made them a dumping ground for crops produced in developed countries. Furthermore, IMF-WB and its corporate allies’ policies of “development aggression” in favour of building dams and increased natural resource extraction have destroyed the environment and indigenous sovereignty. For these reasons, developing countries continue to be caught in a “debt trap” created by their former colonial masters. IMF-WB’s current plans to “Maximize Finance for Development” that aims to leverage the private sector to deliver infrastructure projects and social services, will ultimately have high costs and benefit few. ILPS-Canada reiterates its support for the PGC and allied actions across the world against IMF-WB, as these organizations are central tools of US-led imperialism. Such actions show that people are fed up with the current imperialist system and desire a system based on social justice and solidarity. ILPS-Canada reiterates the call that activism is not a crime and denounces attempts by the Indonesian state and the IMF-WB to suppress this conference and the right to protest. Junk IMF-World Bank!